Originally published under the title "Old Glory's Old News to the New Democrats as the Palestinian Flag Flies at the DNC." 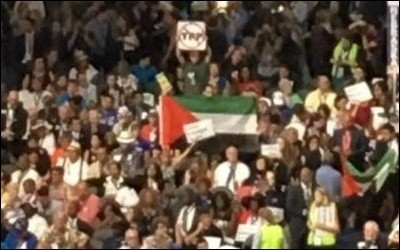 Bernie Sanders delegate Ali Akın Kurnaz raised a Palestinian flag at the Democratic National Convention on July 25. The flag of pan-Arab nationalism, born out of violent rebellion and struggle (or jihad), was flown today on the floor of the Democratic National Convention. What it means that the flag of "Palestine" can be spotted in Philadelphia, with not an Old Glory in sight, is that the Democratic Party of America is taking a hard-left turn. Bernie Sanders delegate Ali Akın Kurnaz is being credited on Twitter with raising the flag which represents a violent struggle against the only functioning democracy in the region, Israel. This is the only reasonable interpretation of what hard-left activists attempt to dress up in the garbs of "human rights" and "self-determination." The Palestinian flag is symbol of barbaric Arab nationalism, the kind of which saw the Grand Mufti of Jerusalem meet with Adolf Hitler in 1941 to discuss ridding the Arab world of Jews. According to Time magazine, Haj Amin al-Husseini – who someone like Mr. Kurnaz would presumably laud as a "freedom fighter" – began his meeting with the Nazi leader by declaring that the Germans and the Arabs had the same enemies, including "the English" and "the Jews." In a historical context, his further mention of Communists was only another nod to his vicious anti-Semitism. The Palestinian flag represents violent struggle against the region's only functioning democracy. But grassroots activists scarcely dictate the wider views of the party, you might argue. And there are plenty of Democrats who are affirmed friends of the State of Israel. True, but with the pace of politics right now, we must address the trajectory of the party. We can do this in two ways. Are these views becoming more prevalent within the Democratic Party of America? The answer, if we look to this convention, is yes. Earlier today, a Democratic member of the House Armed Services Committee compared Jewish Israeli settlers to termites, according to the Free Beacon. Rep. Hank Johnson (D., Ga) said: "There has been a steady [stream], almost like termites can get into a residence and eat before you know that you've been eaten up and you fall in on yourself, there has been settlement activity that has marched forward with impunity and at an ever increasing rate to the point where it has become alarming." Anti-Israel views are becoming more prevalent within the Democratic Party. This comes at the same time that delegates and protesters demanded the removal of theConfederate flag flag of the State of Mississippi for representing "oppression". This is a state with a population that is at least 40 per cent black. And they don't seem to have a huge problem with it. In fact, you might interpret pride in the state flag as a microscopic version of nationalism. For Palestinians and anti-Semitic Arabs such things are fine. For proud Americans, it is oppression. And the second way to gauge the future of the Dems is to look to my home country, the United Kingdom. Jeremy Corbyn, who has also appeared alongside hard-line Palestinian nationalists, is now the leader of the Labour Party in the UK, and has condemned his party to endless infighting and presided over a drastic drop in its popular support in the country. This is the future of the Democrats, as Bernie Sanders supporters flood the grassroots, and moderate voices begin to be hounded out to placate a radicalised youth. My friend and former Al Gore Communications Director Larry Haas told me not so long ago: "I didn't leave the Democrats, they left me". Back to the issue of pace. How long will it take for the rot to set in? The next DNC chairman is Rep. Marcia Fudge (D., Oh). While having previously declared herself a supporter of the State of Israel, she was one of the few – alongside Clinton vice presidential pick Tim Kaine, Elizabeth Warren, and Bernie Sanders – to skip an address by Israeli PM Benjamin Netanyahu last year. She called the event "inappropriate" and said it undermined the U.S. president. And since 2011 she has become less and less outspoken on Israel, seeking to placate her Jewish constituents with tweets about Yom Kippur instead. The Democrats are experiencing what happened to Britain's Labour Party – a hard-left takeover. It is no surprise therefore that her rankings with the "End the Israeli Occupation" group have risen between 2013 and 2015, almost doubling over that time period. Even if she is a friend of Israel, she is unlikely to be able to handle the onslaught from her party's new base. They'll literally shout her into compliance. What is happening to the Democrats, as happened with Britain's Labour Party, is a hard-left takeover. And what's left of the moderates inside the party are not equipped to repel the advance of the Communists. Well, check this out, from Philadelphia, this week.